Whether you work solely from home, or simply like to get a little done after hours in preparation for the next day, an organised workspace is the key to efficiency and success. However, with all of the paper, mail, and general clutter that accumulates, it can be tricky keeping everything neat and tidy. Take control of your workspace mess before it takes over entirely! 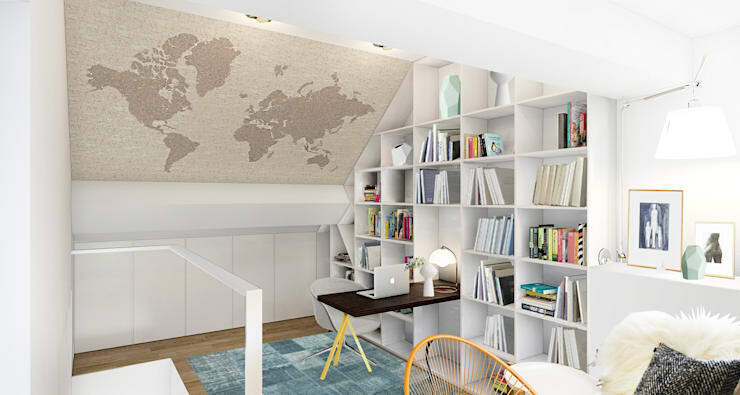 Today on homify we are going to be looking at 9 easily implemented fixes that are sure to help improve your home office’s overall aesthetic, while increasing your productivity. If you are looking for some helpful solutions to office clutter, disorganisation or disorder, then read on below for our handy hints and simply solutions. Paper is the number one item that causes clutter. Instead of creating messy and chaotic piles on your desk, purchase some easy containers, boxes and storage stands to keep everything in easy reach and well organised. We all tend to accumulate magazines, and these can easily become overwhelming clutter if they aren’t ordered. By hanging them on the wall you will always have quick access to the latest editions, and be able to see your collection. It can become a habit leaving a desk messy once you have finished working, but one of the best ways to keep your space organised is to ensure your put everything away once you are complete. Make sure you have enough storage space, and create cleaning your desk a part of your everyday routine. 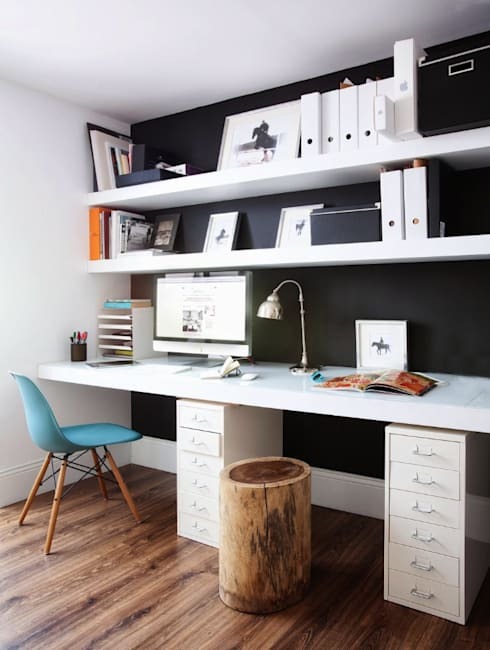 Personalising a home office is important as it ensures it is a successful and accommodating area to work. 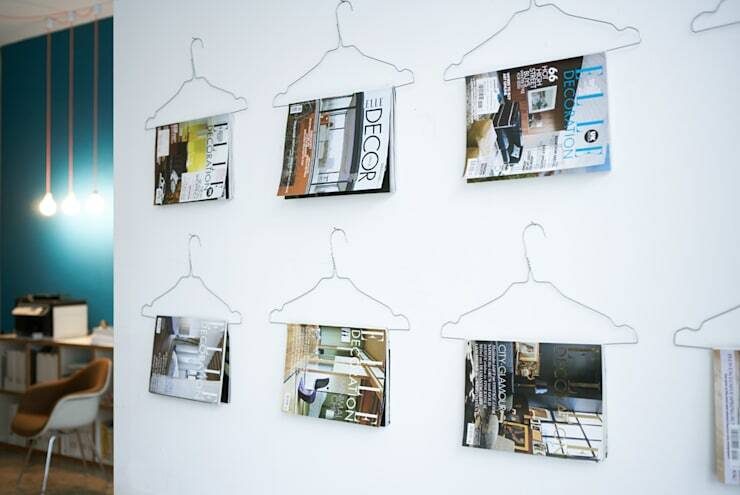 Instead of having pictures leaning on your workspace, try hanging everything neatly on the wall above. You will be able to see it, while it stays out of the way of your desk area. Instead of having your desk against the wall, try a wall of storage instead. Take some cues from this impressive example, and ensure your home office makes the most of its allocated workspace. Adding large or awkwardly shaped cupboards to your home can be a challenging task, chat to a professional joiner to get some expert advice before you begin! 6. Categorise, alphabetise and organise! We’re heading back to basics with number six. It is time to organise your books, CDs, DVDs, and any other clutter you may have within the space. 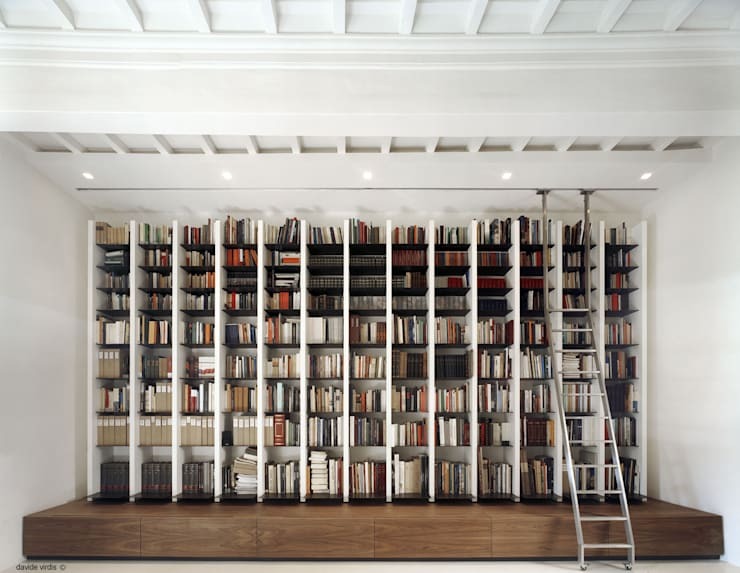 Pull everything out of its shelves, reorganise and ensure that everything is in a clear and logical manner. This will help prevent mess in the long term! It may seem counterintuitive, but good lighting helps you stay neat and tidy. With no dark corners for mess to hide you can be sure that your study will stay easy to clean and remain tidy. Instead of hundreds of small Post-Its and pieces of paper to remind you what to do, why not employ a chalkboard wall instead? This will provide a neat, tidy and chaos free place for all of your meetings, ideas and thoughts. One of the most important items we haven’t yet covered is the storage. More than simply folders for your papers, good cupboard storage is essential to the proper functioning of your workspace. 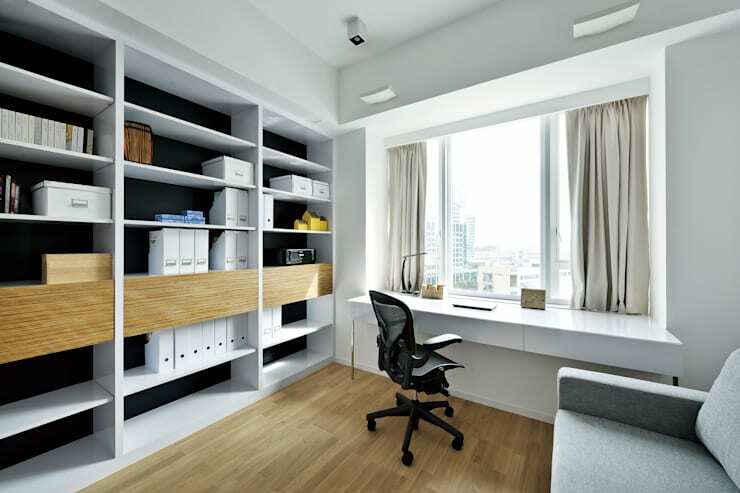 Look for wall-mounted cupboards if you are lacking space, and an under desk drawer for stationery and files.